"Trip generation hubs and rates committed to development and social inclusion"
• Analysis of trip generating developments by space syntax - a case study of Brasília, Brazil, by Ana Paula Borba Gonçalves Barros*, Erika Cristine Kneib, Mariana de Paiva, Giovanna Megumi Ishida Tedesco [paper in English]. • Commuter train usage considering favelas and station boarding rates, by Jorge Augusto Martins Gonçalves*, Gustavo Teixeira de Andrade, Licinio da Silva Portugal [paper in Portuguese]. • Indicators for urban design and their relationship with the propensity to walk, by André Ricardo Prazeres Rodrigues*, Josefina Flórez, Denise Beer Frenkel, Licinio da Silva Portugal [paper in Portuguese]. • Influence of users’ profiles and locations on the trip generation rates of higher education facilities, by Peolla Paula Stein, Antônio Nélson Rodrigues da Silva* [paper in Portuguese]. • Standard of trips generated by private universities of the city of Uberlândia, Brazil, by Ana Flávia Ferreira de Castro Paula*, José Aparecido Sorratini, Thays Pereira Silva [paper in Portuguese]. • Analysis of the evolution of trip generation rates associated to education institutions as published by ITE, by Ângela Beatriz Souza Bertazzo*, Maria Alice Prudêncio Jacques, Jorge Galarraga, Marcelo Herz [paper in Portuguese]. • Analysis of trip generation rates and models for hypermarkets and supermarkets, by Marcelo Herz*, Jorge Galarraga [paper in Spanish]. • Trip generation in parking lots: the case of downtown Niterói, Brazil, by Elisabeth Poubel Grieco*, Sergio Marcolini, Osmar Soares Fillho, Licinio da Silva Portugal [paper in Portuguese]. • Analysis of the salgado filho airport as a trip generator center, by Lenise Grando Goldner, Aline de Melo Nascimento, Ilce Marilia Dantas Pinto* [paper in Portuguese]. 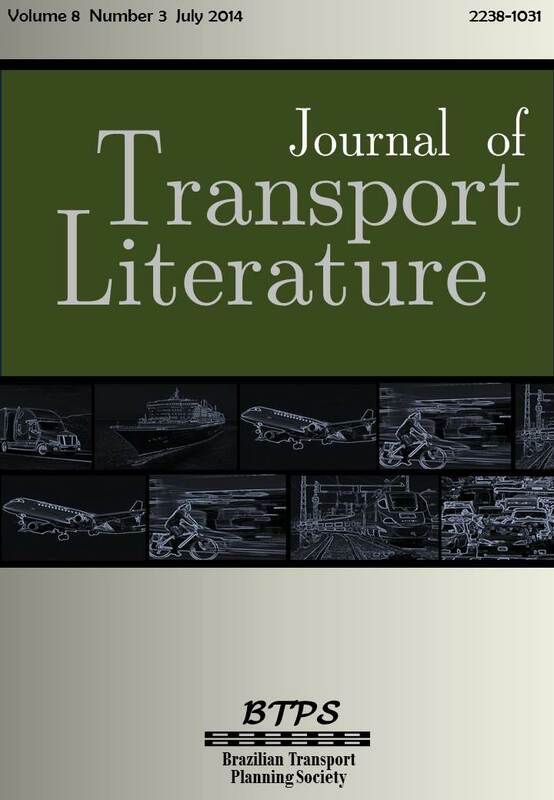 • Environmental performance of freight trip generation hubs, by Vanessa de Almeida Guimarães, Ilton Curty Leal Junior, Márcio de Almeida D’Agosto, Amanda Fernandes Ferreira*, Cinta Machado de Oliveira [paper in Portuguese]. • Improving the environmental performance of trip generators: case study Sepetiba Tecon terminal, by Cintia Machado de Oliveira, Amanda Fernandes Ferreira, Márcio de Almeida D’Agosto, Ilton Curty Leal Junior, Vanessa de Almeida Guimarães* [paper in Portuguese]. • Trip generation hub: analysis of an urban passenger terminal attached to a commercial center, by Elen de Oliveira Mendes*, José Aparecido Sorratini [paper in Portuguese].